Incendiary has only a one week run in LA. “Incendiary” in every sense of the word. Like an onion, as layer upon layer is pulled away in Steve Mims’ and Joe Bailey, Jr.’s film “Incendiary: The Willingham Case,” more and more is revealed and exposure to the deeper layers pulls at the tear ducts both in frustration and sadness. On December 23, 1991 a house in the small town of Corsicana, Texas exploded into flames taking the lives of the three small children of Cameron and Stacy Willingham. Stacy was out shopping that morning and Cameron, panicking ran out of the house leaving Amber Louise, 2, and twins Karmon and Kameron, 1, trapped in the house. Cameron, in shock, told several different stories of how the children got left behind. There were those who saw someone cavalier about the loss and others who saw a man ripped apart by tragedy. What Deputy Fire Marshal Vasquez of Corsicana saw was a man who had committed arson and was, therefore, a murderer. Historically, fire investigation was conducted by police officers or firemen who had been given minimal training, usually learning from a more experienced fire investigator who passed on the “lore” of fire investigation as he had been taught in the past. Following a test, the individual would become a “certified” fire investigator. Nowhere in this training was there any scientific information about fire, its causes and patterns. Fire investigation was considered an “art,” not a science; it was handed down from fire investigator to fire investigator all based on a “trust me, I learned this from the guy who taught me” basis. Fire investigators rejected the science, the chemistry, physics and math, believing that the only way to learn about fire was to work in the trenches of sparks and ashes; the fire would “speak” to them and tell them the “truth.” The “folklore” approach was supported by the International Association of Arson Investigators which officially decreed that arson investigation was an art and not a science. It was not until 1992, with the publication NFPA 921 “Fire and Explosion Investigation,” that the National Fire Protection Association supported a scientific approach to arson. It was anti-science fire investigators who decreed the fire at the Willingham home an arson caused by the spread of accelerant throughout the house. Despite the fact that no such powerful accelerant was found, just one can of lighter fluid from a past barbecue, the case for arson was made. The only substantive finding was a “pooling” pattern on the floor of the girls’ bedroom, a pattern that is consistent with accelerant-based fires despite the lack of residual traces of a accelerant beneath the pooling or anywhere else in the house, with the exception trace amounts near the porch where the Willinghams had recently had a barbecue. Cameron Willingham, himself, was not the poster child for reasonable doubt. In trouble with the law since childhood, abusive to his wife, hostile, tattooed and with a love for heavy metal music and its iconography, Cameron was branded a Satanist by the judge and a psychopath by the State psychiatrist who never interviewed him. It didn’t take long for the jury to convict him of a triple homicide and condemn him to death. It was not until late in the appeals process that the fire investigation reports were sent to one of the leading experts in the science of arson investigation, Gerald Hurst, whose report declared definitively that the Willingham fire was not arson. Hurst’s report was hurriedly sent to Governor Rick Perry’s office in hopes of obtaining a 30 day stay of execution for further investigation. Whether Perry read the report or not, he denied the stay with only the comment that Willingham was a wife-beater and a monster. He later dismissed the findings by Hurst and two other renowned investigators, John Lentini and Craig Beyler. Willingham was executed on February 17, 2004. Rick Perry and everyone involved with the case, including Willingham’s court-appointed attorney, have steadfastly maintained the propriety of the trial and the defendant’s guilt. Further complicating matters in the case, at some point following Willingham’s conviction based on the Corsicana Fire Marshall’s “lore” approach, the Texas State Fire Marshall’s office formally adopted NFPA 921. Barry Schenk, the co-founder of the Innocence Project, makes the valid point that all cases with verdicts of arson made prior to the adoption of this standard should be reviewed for possible reversal. Although successful in eventually obtaining the exoneration of Ernest Willis who had been convicted of arson murder and sentenced to death in 1987 under similar circumstance under a previous Texas gubernatorial administration (Bill Clements). Texas, under Perry, has consistently blocked this and every other attempt to revisit Willingham. At issue, and lost by the Governor, his appointees and those involved with the original conviction, is not the guilt or innocence of Todd Willingham, it is, simply stated: Was the science, or rather the “junk science,” behind the conviction sufficient to come to its conclusion? If that answer is no, then Todd Willingham did not start the fire that caused the deaths of his children and is innocent of the crime for which he was convicted and executed. Perry, a so-called “Christian,” seems intent on protecting his legacy of infallibility rather than recognizing the inherent faults within human nature and human judgments. It is his very rigidity that gives fuel to opponents of capital punishment. The Christianity of “to err is human, to forgive divine” is replaced by “vengeance is mine, saith the Lord,” but only if Perry is the Lord. 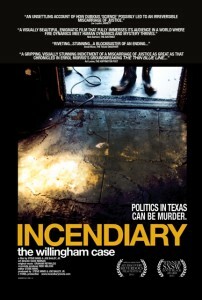 “Incendiary: The Willingham Case,” winner of the SXSW 2011 Louis Black Special Jury Prize, opens November 18 for one week only at the faraway Laemmle Fallbrook 7 in West Hills. Steve Mims and Joe Bailey, Jr. will appear in person on November 18 and 19 at the 2:30 and 5:00 showings to answer any of your questions.